Nova Karina Devonie is a busy Seattle musician who delights audiences with her sensitive accordion playing, sonorous singing style, and sideways fashion sense. 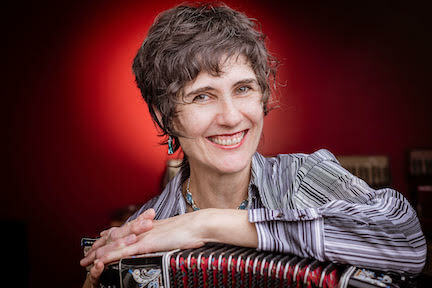 Interested in the amazing connection and communication that music can provide, she loves adding accordion to many styles of music. Nova divides her time between performing in bands, teaching private music lessons, and composing music with David Miles Keenan for the duo Miles and Karina. She first attended PSGW in 1984 as a student and is so glad to be a part of this wonderful musical community.